UCLA Recreation/Marina Aquatic Center is extending enrollments to Westside Extension for water recreation classes in Marina del Rey. Discover for yourself the exhilaration of kayaking as you glide across the surface of the ocean, communing with birds, dolphins and harbor seals. Learn basic strokes, rescues and boating safety in ocean-touring kayaks. You must be in good health, able to swim 300 feet and tread water for five minutes, and not afraid of the water. 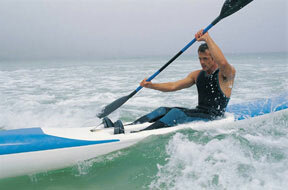 Sea Kayaking classes meet for a total of about 8 hours. Receive two hours of post-class rental time free! Enrollment is very limited for these classes, registration closes 3 days before the class starts. Call the Extension office directly at (310) 287-4475 to register; sorry, no online registration allowed. Please read: REGISTRATION CLOSES 3 DAYS BEFORE CLASS STARTS. Class held off campus in Marina del Rey. Directions provided upon registration.